The club was first known as the Lanakila Athletic Club, but later changed to Lanakila Outrigger Club and finally changed to King Harbor Outrigger Club. Today everyone "Unofficially" calls it Lanakila Outrigger Club. Launching from the beach every day was hectic and taught the crews to be efficient paddling through surf. Lanakila is made up of a diverse group of paddlers ranging from our junior paddlers ages 12-19 to our adults ages 19-75, and from varied backgrounds such as lifeguards, firefighters, teachers, and many more. Members come to the team with varying athletic backgrounds, with some looking tobe highly competitive and others for the chance to exercise and meet new friends. LANAKILA CREATES AN ATMOSPHERE WHICH UNITEs MEMBERS' COMMON INTEREST IN PERPETUATING and PARTICIPATING IN HAWAIIAN OUTRIGGER CANOE RACING AT ITS HIGHEST COMPETITIVE LEVEL. 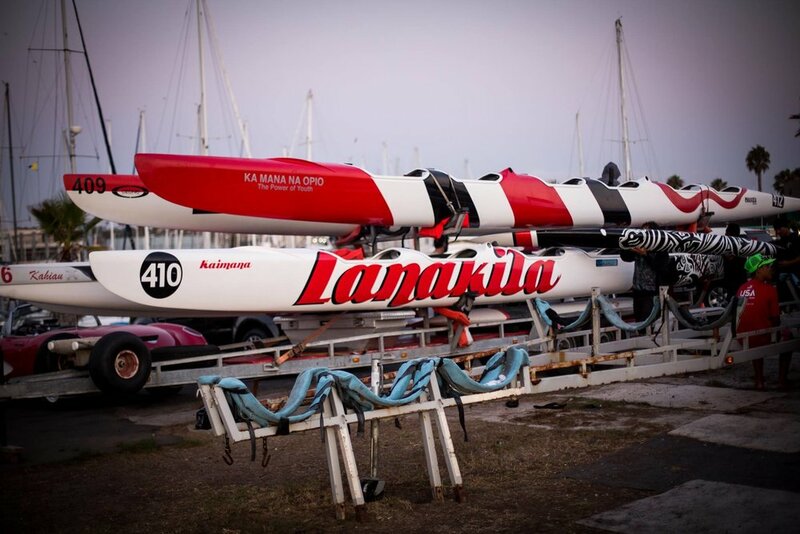 Lanakila Outrigger Canoe Club is based in Redondo Beach, California. We have as many as 5-6 men's teams and 5-6 women's teams in a given season, and have varying levels of experience in each team from beginners (novice) to world class athletes who have competed in the Olympics. That is over 150 paddlers each season. People who have never paddled before are encouraged to come out. There is even a whole division of people who have never paddled before called NOVICE paddlers. The races are shorter, and much instruction is given. So it's OK to get involved at any time - you get to join a whole bunch of people in the same boat - so to speak. Lanakila welcomes all potential paddlers and paddlers from clubs around the world (including visiting paddlers) to join us for practice. Our practices begin in March, for new paddlers, for both men and women. The practice and race schedule is posted on the calendar Page. Schedules are subject to change, so always check back for updates. Typically, Novice practices will be held on Sunday mornings in March and April then the Novice will be merged in to practice with the veterans after that. Practices are held on Monday and Wednesday evenings for Women and Tuesday/Thursday for Men. The practices begin at 5:30 p.m. and continue until dark. Weekend practices are scheduled at various times so be sure to always check back or with the coaches.